But first, a bathroom redo update. The night before last Hubby got the bathroom sink drain all hooked up and it works! Last night he finished the rest of the cabinet work so today I can start loading it up so the drawers from the old vanity can get out of the guest room. He has some other ideas about customization but those will wait. We are pretty sure about paint color but today I will paint a larger area and do two coats of our favorite so we can be sure. Yesterday morning I headed out to the fairgrounds to deliver my quilts (no one ever called me to drop off their quilts) and help with setting up the show. The first job was laying out all the quilt stands and getting them hooked together. At one point we had to call in everyone so we could move one section with one person for each upright. Wish I had a video of that to post! Once things were set-up and straight we started distributing the quilts to their spots. We had great maps but it was so easy to get turned around! Mine is the one on the right. The main difference is that she hand-quilted hers and I had mine machine quilted by my friend Deb Barth in Montana. We had about half of the quilts hung by lunch time and after a quick break for a delicious box lunch we headed back to the quilts and finished the hanging. 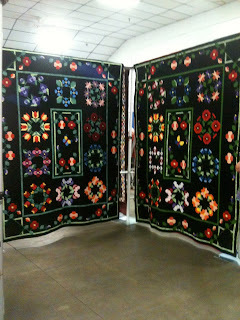 As the quilts went up it was hard for all of us to stay focused on hanging and not stop to examine the quilts! Once things were up there were some adjustments. There were also about 4 quilts that never showed up for hanging so we found Community Quilts (charity quilts) to hang in their places. A last check for extra poles or empty bags, etc. and we were done. 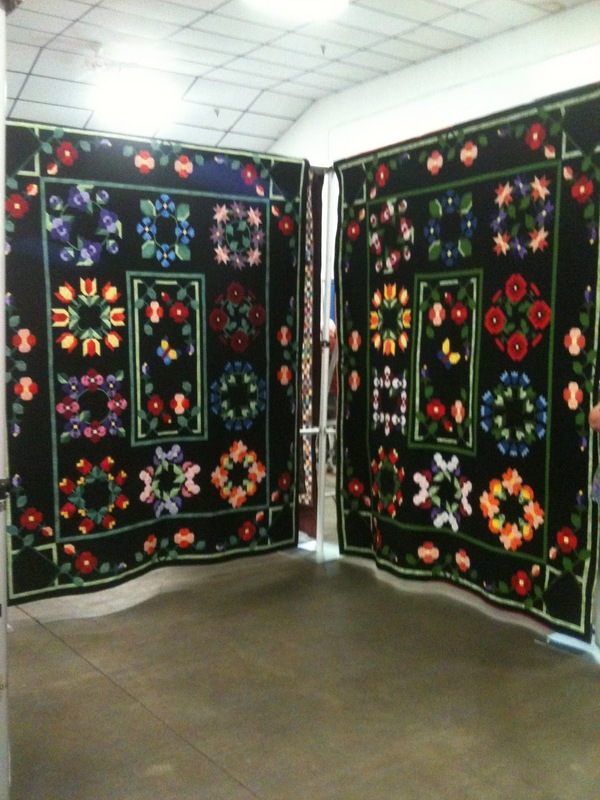 There are a lot of great quilts in the show and I will be bringing my camera tomorrow when I will be there to do a couple of volunteer shifts. I definitely need pictures of a couple of great scrap quilts.